Females weigh between 50 and 65 pounds and stand 23 to 26 inches at the shoulder, while males weigh between 65 and 85 pounds and stand 26 to 30 inches at the shoulder. Although Greyhounds are not small dogs, many adopters report that they are almost cat-like inside their homes in that the dogs seek a quiet corner from which to enjoy the company of their humans. How old are the Greyhounds that are available for adoption? The average age range of our former racers is 3 to 4 years old. Some are retired as early as age 2, while others stop racing at the mandatory retirement age of 5. Some people enjoy older dogs, and we occasionally have Greyhounds in the 8 to 10 year range available for adoption. How long do Greyhounds live? The normal life expectancy of a Greyhound is 12 to 14 years. No. While Greyhounds love romping and frolicking outside, they have very little body fat and thin skin, and are very susceptible to extremes of cold and hot temperatures. At the track, Greyhounds live inside in heated and air-conditioned kennels. 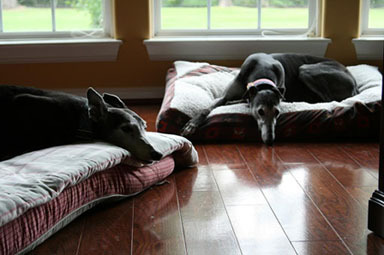 So between play or "potty" visits outside, Greyhounds need to be primarily inside house pets. Can I let my Greyhound walk with me off lead? Only in completely fenced areas. Greyhounds have been bred to chase for thousands of years. Because of this genetic make-up, even the most obedient Greyhound will not come when called if he sees a rabbit or squirrel to chase. They will pursue their quarry oblivious to their surroundings, including cars or the distance they have run from their owners. For that reason, adopters must agree in their adoption contract that they will never allow their Greyhound off lead in any unfenced area. Are the former racers housebroken? In the racing kennels, Greyhounds sleep and eat in large crates, and are trained not to soil their crates. In the pet home, housebreaking is simply a matter of training the Greyhound that your home is a large crate. If you follow a regular routine of outside visits, housebreaking is usually easily accomplished. The answer depends on the children -- and the parents. It's impossible to make a blanket statement and say that all ex-racers are good with children. But it's hard to say that they're not because there are many families with children and Greyhounds doing just fine. It must be remembered that these are adult dogs that may never have been exposed to small children and their high-pitched voices and quick movements. While Greyhounds are, as a breed, very tolerant and sweet natured, and would usually rather walk away than snap, they do have their limits, just as does any breed. Children MUST be taught the proper respect for the dog, and not become overbearing in their actions toward the dog, particularly as it relates to the Greyhound's personal space. No -- just the opposite, in fact. Docile and low key, Greyhounds are often described by their adopters as very laid-back. Aggressiveness has been bred out of racing Greyhounds because they can be disqualified from the track if they even turn their heads during a race. They wear muzzles while racing to help make their noses appear more prominent and assist the racing officials in determining the winner of a "photo finish." Do Greyhounds need lots of room to run? While Greyhounds do love to run (and it's thrilling to watch! ), they need no more exercise than any other dog. A nice long walk on the leash three or four times a week is recommended (and it's good for humans, too!). Many adopters have discovered that Greyhounds make great jogging companions, while others enjoy finding fenced areas to let their Greyhounds really stretch out. 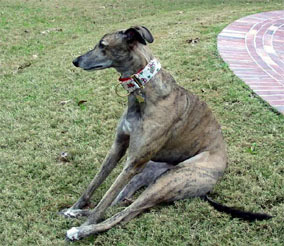 However, greyhounds are susceptible to heat stroke and care must be taken with the Houston heat and humidity. While a fenced yard is ideal for both Greyhounds and their owners, it is by no means a requirement. Many, many former racers have found happy homes in apartments and condominiums. Can Greyhounds live peacefully with cats? In our experience, about 70 to 80 percent of Greyhounds are "cat tolerant," and do just fine with cats inside the home. We "cat test" our adoptable Greyhounds with a dog-friendly cat to gauge their level of interest. While the test is not absolutely foolproof, we find that it is generally a reliable indicator of how the Greyhounds will react to a cat. How will a Greyhound get along with other dogs in my home? Racing Greyhounds have lived all their lives with other Greyhounds, and generally enjoy the company of all breeds of dogs. Their easy-going nature extends to other dogs as well as people. Some Greyhounds will react with great interest to small, fluffy dogs, but will generally do fine with them once they realize the little guys are dogs too. As with cats, they should be introduced slowly and cautiously. No. Greyhounds bark very little, and usually are as friendly with strangers as they are with their own family. Greyhounds' sizes may intimidate potential "bad guys," but that's about the extent of their protective abilities. Do Greyhounds have any genetic abnormalities common to the breed? Because racing Greyhounds are bred exclusively for function and temperament rather than to emphasize a particular "look," they have no genetic-related abnormalities. For example, they have one of the lowest incidences of hip dysplasia of all the breeds. Greyhounds' low percentage of body fat makes them somewhat sensitive to some anesthesia agents, but there are commonly used anesthetics that are safe for Greyhounds. Adopters should discuss anesthesia requirements with their veterinarian and make sure that he is familiar with Greyhound sensitivities in this area. Greyhounds should not wear flea collars, but topical flea treatments like Advantage and Frontline are safe for them. How much do Greyhounds eat? We recommend 2 to 4 cups of a premium dry dog food per day for former racers. Ideal "pet weight" for Greyhounds is no more than 5 pounds over their registered racing weight, and we always urge adopters to resist the temptation to "fatten up that skinny Greyhound" by feeding him as much as he will eat. 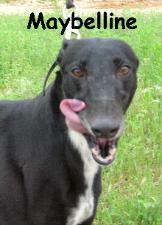 Greyhounds can be "chow hounds," but will hold the right weight very well if fed a moderate amount of a good dog food. Do Greyhounds need much grooming or bathing? Do they shed much? Very little, on both counts. Because Greyhounds have little oil in their skin, they have no "doggy odor," and stay sweet smelling for long periods between baths. Their coats are short and sleek, making Greyhounds very low maintenance dogs when it comes to grooming. While we wouldn't go so far as to characterize Greyhounds as hypoallergenic, many Greyhound adopters who have previously had allergic reactions to other breeds of dogs report that they have no trouble with a Greyhound in their home. Will I get registration papers with my adopted Greyhound? Racing Greyhounds are not registered with the AKC, but are registered with the National Greyhound Association (NGA), the official registry for all American racers. Our Greyhounds often come with their Certificate of Registration, and we will provide that document to you if it is available to us. The NGA is very supportive of Greyhound adoption, and is always very helpful to those adopters who want to research their Greyhound's pedigree. What challenges do Greyhounds face in making the transition from track to home? 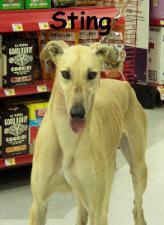 Greyhounds have never encountered stairs, sliding glass doors, mirrors, or toys. Some have initial difficulty with slick floor surfaces like tile floors. They are very bright, and with gentle guidance from their new family, will quickly master climbing stairs and will learn that those glass doors are solid. Watching a Greyhound delight in learning to play with toys (especially the furry, squeaky variety) is great fun!